The Novopro SDX DJ booth has been designed and engineered by working performers to be the most practical and versatile entertainment booth in the market. Manufactured in a tough and durable, powder coated steel finish with solid welded construction points, the SDX booth is built to last. We found that alternative products in the market had a working height that was too low and uncomfortable in use, so we have made the shelf height just over 39" from the ground making the unit much more practical in use. 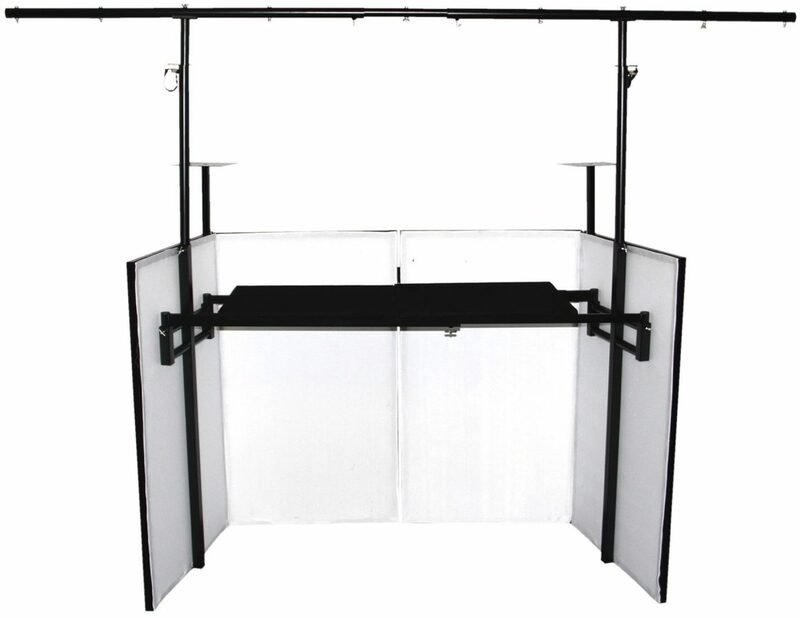 The whole unit is adjustable in width and side panel angles with the unique sliding shelf support system, which maintains a stable platform for the SDX DJ booth. Two rugged, carpet finished boards are supplied to fit upon the width adjustable cross bars, giving a working area of 48" wide x 19" deep. The white scrim panels allow for rear projection of a lighting effect to give you a professional presentation for your clients at your venue. 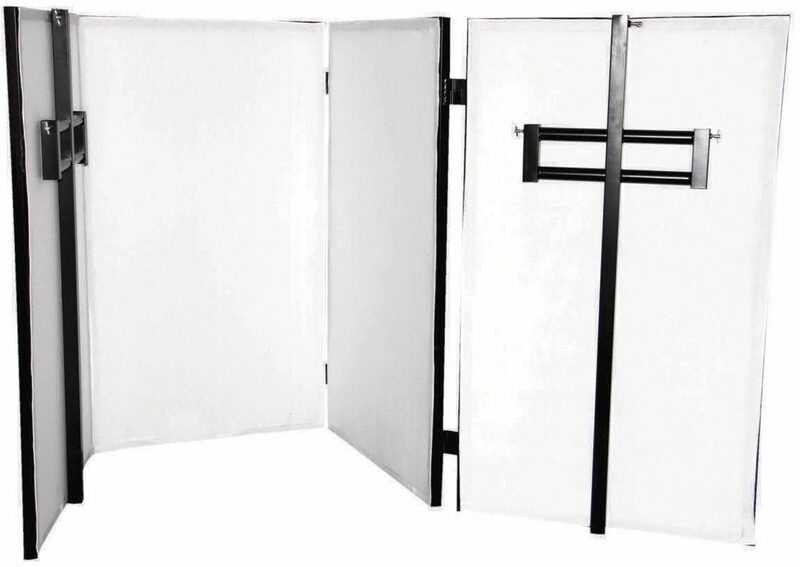 The 4 x white elasticated material panels are attached by the stitched velcro strips and are made from machine washable and flame retardant material. 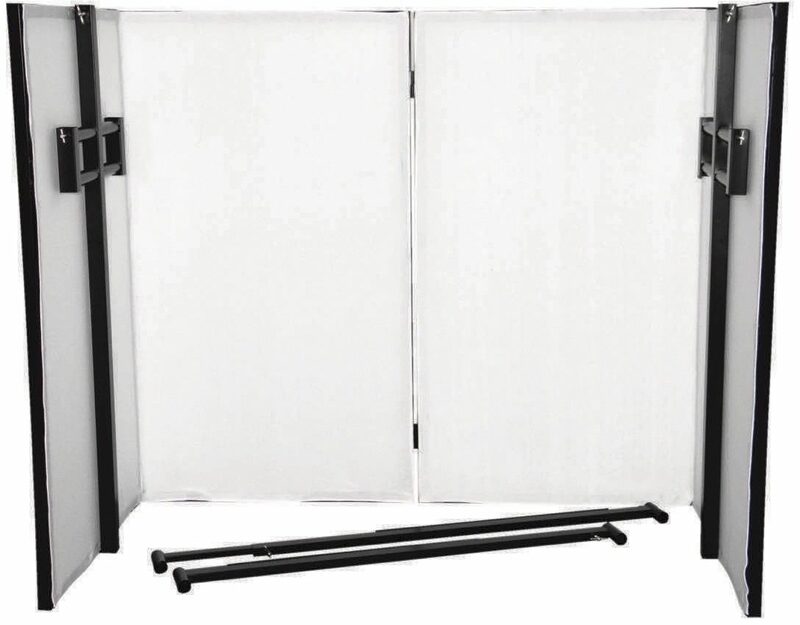 Spare scrim panels are available separately in a White or Black finish. 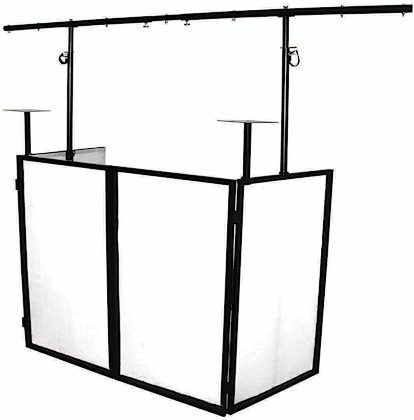 - Main shelf / working height from floor: 39"
- The net weight of the complete system is 62lbs and easily supports 66lbs+ on the top bar and also 66lbs+ of evenly distributed weight on the main shelves. - There are a full range of brackets and other accessories available, so the SDX booth can be customized to your individual requirements. 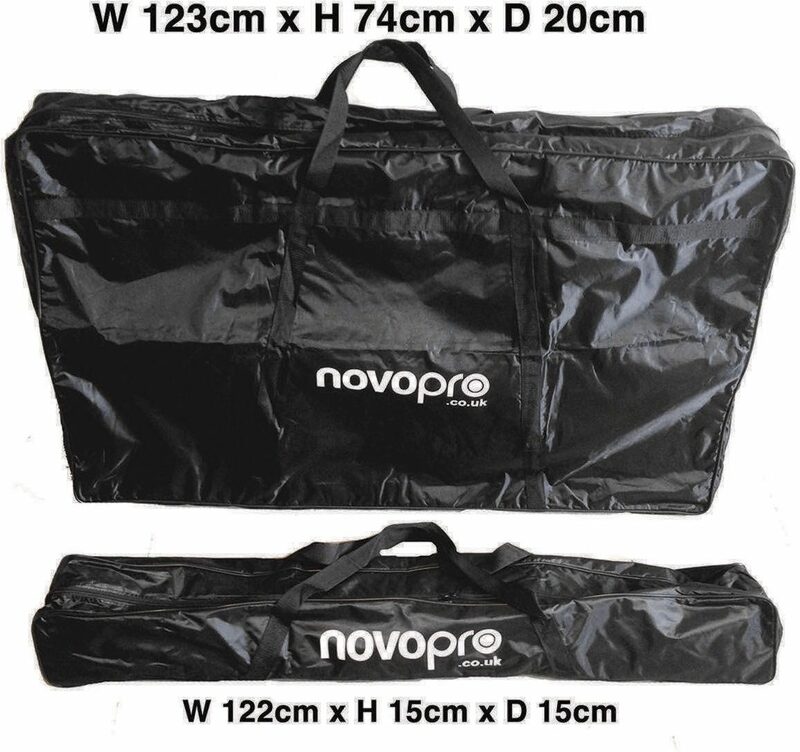 - The Novopro SDX booth is designed and engineered in the UK by working performers. zZounds is an authorized dealer of Novopro products. "Starting to have doubts about its durability"
Overall: I purchased this with really high expectations. Conceptually, Novopro has the right idea. 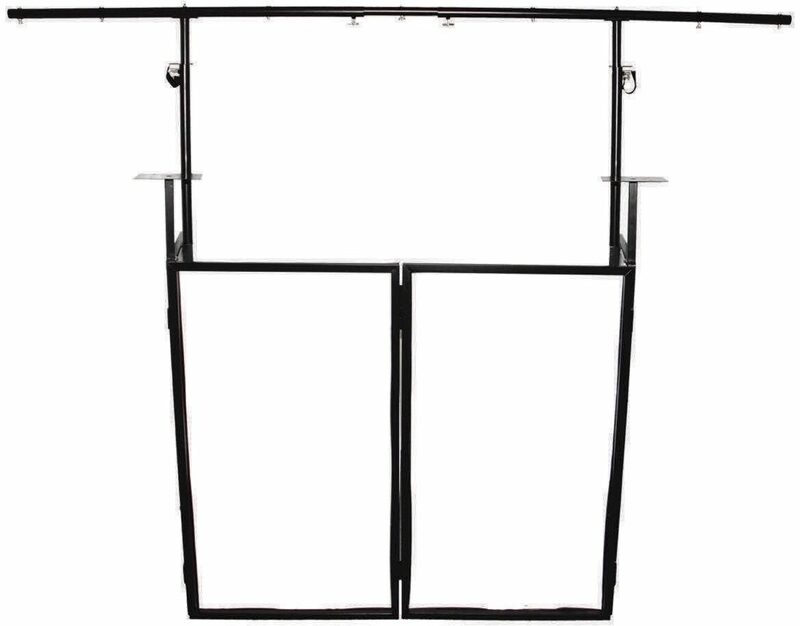 An all-in-one facade and truss mechanism for your dance floor lighting. First impressions? It looks good when setup and lit. Uplighting looks good underneath it as does adding a moonflower capable device under it pointing to the front like an ADJ Stinger (creates a cool TV screen effect in the front). It feels like solid hardware and has a little weight to it which is ironic because the only thing that I really question is it's craftsmanship and durability. Just so you know, I'm not an overtly picky person by any means, but when you pay close to $600 for an item, you expect to get your money's worth. The welding that holds the nut that screws go into appear to warp if you tighten the screws onto them, be careful not to tighten to much or they will break. The one on my left where the truss attachment goes is warped and will break if I am not careful. The laptop stand attachment was part of the reason that it warped. The weight of this attachment combined with a laptop on it will force you to overtighten, otherwise it will hang on a slant. The included moving head stands that go in front of the unit look like they may need sone C clamps to ensure that they don't fall off. I don't feel comfortable with the way that they bolt onto the facade and they don't appear to be very secure. Can you imagine your moving heads flopping over on these things during a gig? Not only would that make for a YouTube moment, but it would probably be costly (moving heads are expensive!). For anyone wondering how long I have been using this item:One time, to setup and look at itOne time to setup with lights and look at itOne gigNovopro has the right idea, and again I like it conceptually. But for the hefty price tag they need to now focus on quality assurance and durability. No one wants to buy one of these every year.